CHICAGO—While the turnout may have been smaller than the anti-government demonstration that shut down the Dan Ryan Expressway last month, the impact and attention that local activists, organizers, pastors and community residents, all of whom are upset and frustrated with violence plaguing the South and West Sides of Chicago, captured should not be understated. For days, local news media reported on the planned march to shutdown Lake Shore Drive on Chicago’s North Side, which remains predominantly White and often sheltered from havoc suffered in the city’s Black neighborhoods. The march was set for the height of rush hour, on the first day of the Lollapalooza music festival just a few miles away, and hours before the start of a Chicago Cubs game, angering many North Side residents and business owners in the Lakeview and Wrigleyville neighborhoods who would be affected. But that was exactly the point. Wrigleyville and Lakeview are 81 percent and 80 percent White respectively. The two neighborhoods sit along the shoreline of Lake Michigan and during the summer months, serve as playgrounds for Whites in the city and surrounding suburbs to come and enjoy the weather, activities and nightlife. It’s not uncommon to see people riding bikes, pushing strollers and walking dogs in these communities, activities they can take for granted because they are insulated from the harsh realities and daily violence faced by those, who if only for a few hours, brought White residents face-to-face with the people who live in parts of the city they only hear about on the news. Unfortunately, but not surprisingly, protestors were met with antagonism from residents who seemed annoyed at their presence Aug. 2 which disrupted daily routines. 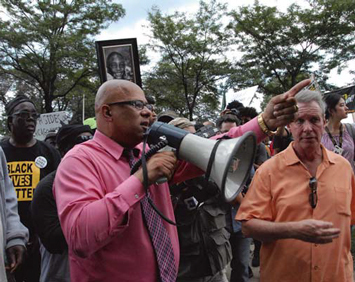 It was expected animosity that Eric Russell, another community activist and march organizer, said had been going on all week. 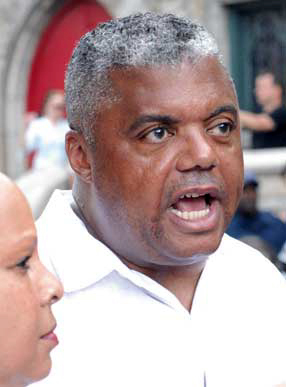 Mr. Russell told The Final Call that he reached out to the Nation of Islam’s Justice Or Else! Local Organizing Committee after receiving six death threats. Many of the threats came via social media, he said, as well as from a variety of different people, including former police officers and an irate soccer mom. Between Lake Shore Drive where the march started, to the outside of Wrigley Field where it ended, harsh words were exchanged as protestors used chalk to scrawl statements such as, “Enough is enough,” and “16 shots by killer cops,” a reference to the killing of Laquan McDonald by Chicago Police Officer Jason Van Dyke, whose trial begins in September. 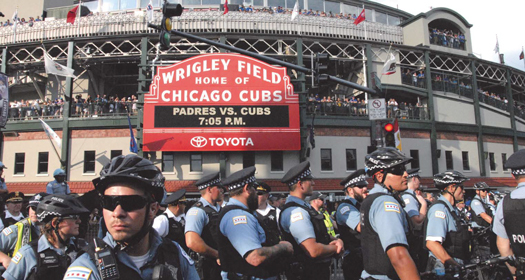 Wrigley Field is home to the Chicago Cubs baseball team, which had a game the day of the protest. All of this underscored the true mission of the protest and march, which was to call for the resignation of Mayor Rahm Emanuel and Chicago Police superintendent Eddie Johnson. While local media reported that approximately 200 people showed up to protest, organizers say the actual number was closer to 500. The underestimating of crowd size, especially where Black demonstrations are concerned is certainly nothing new. The Million Man March organized by Min. Louis Farrakhan, was said to have been attended by 400,000 people by the United States Park Police, when the actual number was 1.5 to 2 million people. Aside from the friction from community residents and what appears to be a downplaying of the demonstrations impact by police, Rev. Livingston wants the insulated residents of the Lakeview, Wrigleyville and White communities across Chicago to know the problem of violence affects everyone who lives in this city.